Back in February, I posted a story from CasualGaming.biz regarding the intended audience of Sonic & the Black Knight. Once I read it, I found some solace in that I shouldn’t give a care about Sonic idiotically waving a sword at 300 MPH. Tetsu Katano, the director of the Japan division of Sonic Team, went on the record to tell us older guys to look down on Black Knight as child’s play. So be it, Tetsu. However, I still have to play it to keep myself informed. It’s part of my job here at TSS, because nobody wants to read articles by someone who is completely clueless. When I played the game, I went in with lower expectations than Sonic Unleashed. Considering how much I loathed the werehog, Black Knight was as low as I can get. My rental time with the game can be summed up in Svend’s review, or any review that you can find on the internet in the 60s score range and below. After my experience, I thought of this article by CasualGaming. How do kids react to this game? It was a thought that lingered in my mind until I finally put it to the test. I have spent the last week in Los Angeles, making connections, scouting apartments, soaking up sun, and visiting friends. I went to one of my old mentor’s houses in Burbank. He has a wife, three kids, and, most importantly, a Wii. On a slow day, I rented Black Knight again and asked the kids to play it. The kids were hooked on the presentation, like most people, but could not stand to play the rest of the game. They complained that the game was “too difficult” and that their wrists were getting worn out. From my observations, the difficulty stemmed from the poor design choices in gameplay that a majority of the reviewers have been harping on. The kids refused to play the rest of the game and Katano’s primary audience of new, young Sonic players was violated. You can take as many grains of salt from this experiment as you would like to (it is just three kids after all), but, personally, Sonic Team’s failure to hit their target audience speaks volumes on the state of the series. Next Post > Next post: Trolls, Who’d Have Them? Interesting little experiment there Brad, I wonder what Tetsu Katano would say if you could pass your findings onto him. Interesting what you did with those kids. I hope this doesn’t influence how they feel on the series, though. Anyway from my experience (and from what I’ve read), kids don’t care for the new Sonic much. They prefer the old games (as well as the old school look) over his newer ones. I think it’s time to take a step back Sonic Team, re-evaluate what you have here. Because it seems that you aren’t pleasing either side of the demographic much anymore. Hopefully they’ll take notice of this soon. I’ve played the older sonic games before (Sonic 3 & Knuckles), but I liked Black Knight. It gets a little old, but then you get all this, “SURPRISE! You get a bunch of freakin new items!” out of no where which gives the game some new life. Again, you don’t need to wave it around like a crazed maniac. Just give it a good little twitch or flick. I can see why some people don’t care for it, but it’s like that old saying, “to each their own.” If I may request, though you may not like it, could you please not be too harsh on it. No Drama ’09? They probably should give the game themselves to some kids as part of the official QA process and see how they like it if they announce a game that’s specifically going to be aimed at children. 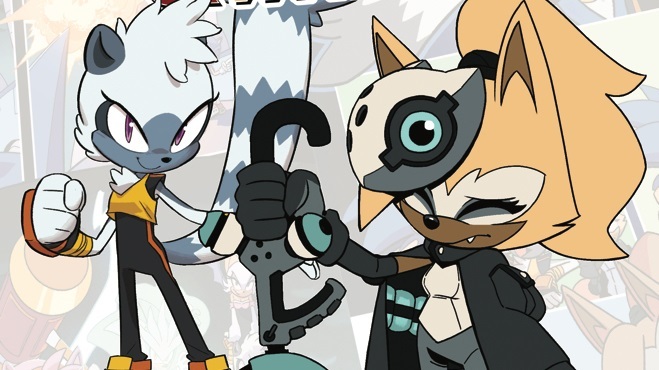 Sonic Team need to stop and take a look at the games that have sold well and rated well in the last few years, and see what was special about them. Maybe they’re actually releasing these games, though, to do that very research. Though Sonic Unleashed did show a step forward with the day stages, the Werehog stages may have been put there to see the response to a game with both types of play, as well as fill the niche you’d be hearing some people complain about by now if it hadn’t gone in. I have another point of view to share… There was an article in my local newspaper where they had children give their opinions on some video games. 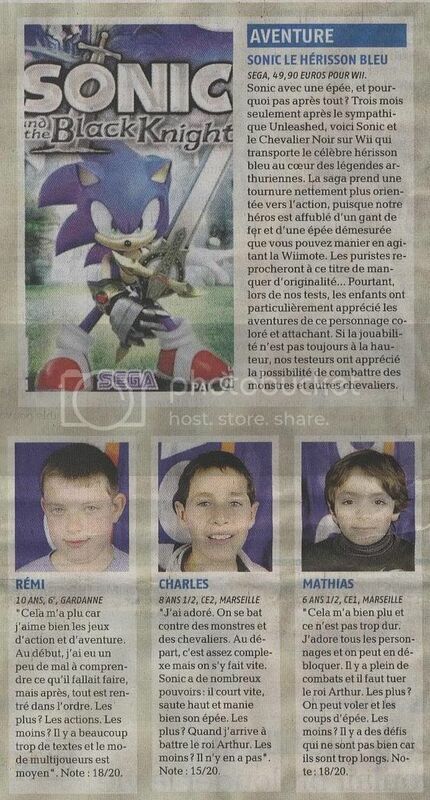 Sonic and the Black Knight was reviewed by six kids (under the age of ten), and the journalist said they actually liked the game (though he seemed quite surprised by that). The kids basically said the game was complex at the beginning but it got better after a while, and they said they liked it. @Keydown: See, I can’t test every kid in the world. That’s why you can take this experiment with a grain of salt. Ehem, Sonic gets blooded in the end… PLUS it’s a 12+. Anywhays its a good way of getting kids to like sonic! @Core: Do you have that article somewhere? It would be an interesting read. @Brad: Yes, I have scanned it, but it’s in French. I can read and speak French rather fluently, so I’ll get to translating this deal and putting it up. As a kid, I rather enjoyed every game that was thrown at me (good or bad). I don’t think today’s kids are much different. Interesting little experiment here, perhaps not completely reliable due to only 3 kids playing it but it speaks volumes for the fact that kids found one of the big problems with the game: the wacky sword swinging. This = wrist ache. although I personally found the game enjoyable, I had to try and learn to get a grip on the game’s mechanics to effectively enjoy the title. if the developer wanted to aim the title to kids, I gotta say, he failed big time. werehog was probably better at that. you need to be able to just “jump in” if it is to appeal to kids.